​CCH Grad, Brendan Dunlop, host of SportsNet Central, shows support for fellow CCH grads with his "W" sign! Great article on Ndorelire family. Children attend Catholic Central. Mrs. Uros, head of ESL at CCH, told the mother that she would find peace in Canada, the mother wept. We have no idea of what many of these families have suffered. Happy Canada day to all our newly immigrated families and to our new Canadian citizens. ​Natalie Salamunec (second from the right) is now a professional model. Here she is on stage with the "Armani" in Milan, Italy at one of the Armani shows in mid September. On Sunday the local medical community had a fundraiser game at Catholic Central between the doctors and medical students. Two former CCH graduates played on the team. Chris Kawala (grad 2006) and Patrick Valke (grad 2006) played on the team of medical students. Next year at this time they will be Doctor Kawala and Doctor Valke! Chris played football, basketball and soccer at CCH and was on the 2006 All Ontario championship team. 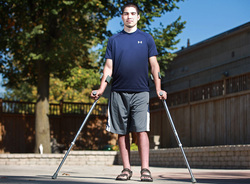 Kevin played basketball until grade 11 and was the quarterback on the football team. 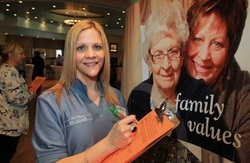 CCH students were on the front page of the Windsor Star (Nov. 18) LINK as they help promote Anti Bullying at school. Lee-Ann is an adventure seeker, world traveller, aspiring humanitarian and proud Canadian—all wrapped up in a corporate lawyer package. Lee-Ann has a long and impressive resume as an advocate and volunteer for groups including Samrakshak Samuha Nepal (SASANE), a Nepalese organization that trains female survivors of physical and sexual violence to be certified paralegals — and the focus of Lee-Ann’s idea for the G Project. 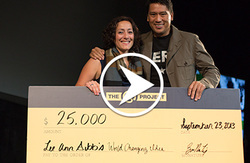 The $25,000 G Project prize will no doubt help her garner more attention and support for SASANE’s worthy cause. Rino Bortolin (Class of approx. 1990), owner of Rino's Kitchen, will be featured on the Food Network's popular show, "You've Gotta Eat Here!" David Pinard (Class of 2008) song for Jess. Each year, the program accepts 20 high school seniors for an advanced science program that provides a preview of college life and an opportunity to learn more about chemistry. Begin-Dyck,was the only Canadian student to attend. studied polymerization, the analysis of chemical components, the properties of fragrances and colors, environmental science, product development, product marketing, and project management. Working in teams, the students used BASF chemistry to formulate their own personal care products, for which they developed business and marketing plans they presented to a panel of BASF executives. 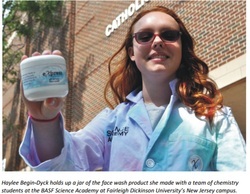 Begin-Dyck’s team developed a face wash product. Catholic Central graduate, Jake Rondot, Managing Director of Human Kinetic Publishing, donated the books for the University of Windsor Book Awards. The University gives a book to a student from each of the local high schools based on combination of academics/athletics/community involvement. Thank you Jake for your generosity to help make this event special for all these students. 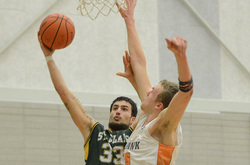 ​Jacob Cusumano (2008 Grad) hits 5 consecutive three pointers plus a buzzer beater to keep Red Deer College in 1st place. ​Jacob Cusumano (2008) - Red Deer College. Jacob is 2nd in Canada, shooting 51.7%. ​Congratulations to Rob Pierce (2008) and Jacob Cusumano (2009) for winning the silver medal at the CCAA national basketball championships for Red Deer College. Former CCH players that also play in British Columbia showed up to support them. Devonte Pierce (2013), Mark Mitchell (2010) and Chris Arcangel (2010). ​Terrance Crawford brother of Dallas Cowboys defensive end Tyrone Crawford has joined the Fratmen after spending last season at Simon Fraser University in British Columbia. He’ll be in the lineup today when the Fratmen face the GTA Bears in Brampton (2 p.m., postgame coverage at windsorstar.com). This broke the OVFL record for most TD's in one game. Miah Marie Langlois (2010 grad) and Khaliel James (presently in grade 12 at CCH) walked away with the two major awards at the WESPY awards last night! Miah led the Lancers to their 4th consecutive national basketball championships. She was a three time 1st team all star while at CCH. As well as a WECSSAA badminton champion. Khaliel is a multi sport athlete - 1st team all star in football, plays on the basketball team and is the OFSAA (All Ontario) champion in the long jump. Khaliel is verbally committed to Guelph University. To boot...both are excellent students. Congratulations to Catholic Central graduate, Frank Jeney for leading the University of Windsor Baseball team to the National Championship. Frank initiated the baseball team at the UofW three years ago. In that short period of time, he has built the program as the top team in Canada. Frank was a former All American baseball player at Wayne State University and track and field champion when at CCH. Wayne Curtin was a long time successful coach at Massey and Forster. He was also on the WECSSAA and SWOSSAA executive for many years. He unfortunately passed away in 2009. An award was created in his honour to recognize one coach in WECSSAA each year. This year, it was decided to also honour an adminstrator. It is an honour that two of Catholic Central's long time teacher/coaches were honoured to receive this award together. Mr. McKittrick has been at CCH since first opening their doors in 1986, coaching freshman and junior boys basketball and badminton. He is on numerous committees including the WECSSA executive, SWOSSAA executive, chairs the eligibility committee and Royal Arcanum. Mr. Cusumano has been at CCH since 1988, coaching Senior Boys Basketball and at some point coaching Sr. Girl's basketball, Jr. Girl's basketball and junior football.